Click on image to view 3106 X 2561 pixels, 4.1M image. "A wave of humanity in a hermaphroditic universal embrace. A study and contemplation regarding polar opposition within the human condition. These were the origins which led to the creation of "Harmonious Convergence". From there and during the execution it led me to include people who have encountered this human phenomenon head on. Gandhi, Martin Luther King, Christ and yes... Hitler are just some of the personalities, which through their walk on Earth, brought this ever increasing intensified polarizing force to the forefront of human consciousness. Now, president all but set of regime change through superior force in a preemptive strike, divergence has stepped up a notch. Aided by the global media, people across the planet found themselves on opposite sides of a manufactured fence. This action was likened to the fall of the Berlin wall but I beg to differ, for this new barrier which separates us has no physical structure but it's psychological reality supercedes any amount of mortar and brick. The polarization of forces. "An eye for an eye and the whole world goes blind", "Love your enemy." and "Thou shalt not kill", just some of the tenets which by their intent should lead humanity beyond the desire for retribution. If one was not to strike back, would the enemy grow tired and eventually just fade from view? Every action, an equal and opposite reaction. Is this true? Then why are we not brave enough to stand by it? One characteristic I find truly disturbing with recent world events (and war in general) is how physical might would seem right, an aspect which negates such notable instruments of change as Gandhi and Martin Luther King. These people knew the distinction between taking and giving a life in the name of justice. Dying for a cause, not killing for one. This is why, when watching this latest human drama unfold via satellite and I heard that a peace protestor was shot and fell into coma purposely putting himself in harms way to help a woman and her children... I wept. By his actions a sliver of hope for humanity broke through the marvels of modern destruction. As far as the central figures Christ and Hitler, someone once said to me, "Wouldn't it be interesting to listen in on that conversation." most likely an understatement but that's where I will leave it. Except, and I feel it is safe to say, they are polar archetypes made manifest. Polarity was the central theme to the piece and I could find no two better suited in portraying the inner human conflict which we all suffer to transcend. The execution of this drawing stretched over three years and in it's creation some notable coincidences transpired. 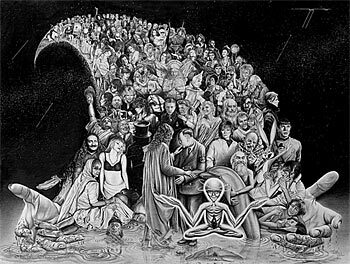 What relevance they hold, outside of the drawing itself and it's course of manifestation, I do not know. While working on the flame of Liberty a news bulletin came over the radio saying the space shuttle Challenger has exploded. That day I put a tear in the left eye of Liberty. Later I found out through the restoration of the statue some years later that what appears as a tear streak from her left eye (actually created by rain water) they were unable to repair. In three years of intermittent work days, the piece could have been finished on any possible date. Then while putting the finishing touches on Robin Williams and as the planets (unbeknownst to me at the time) lined up roughly in the shape of the six pointed star, it was finished. August 16, 1987 and the longest journey I have ever traveled with one piece ended. But it was not until the following day that the relevance of that day would make itself known to me. On August 16, 1987 in various sacred locations across the Earth people gathered and joined in prayer for a course change towards peace through peaceful positive means. 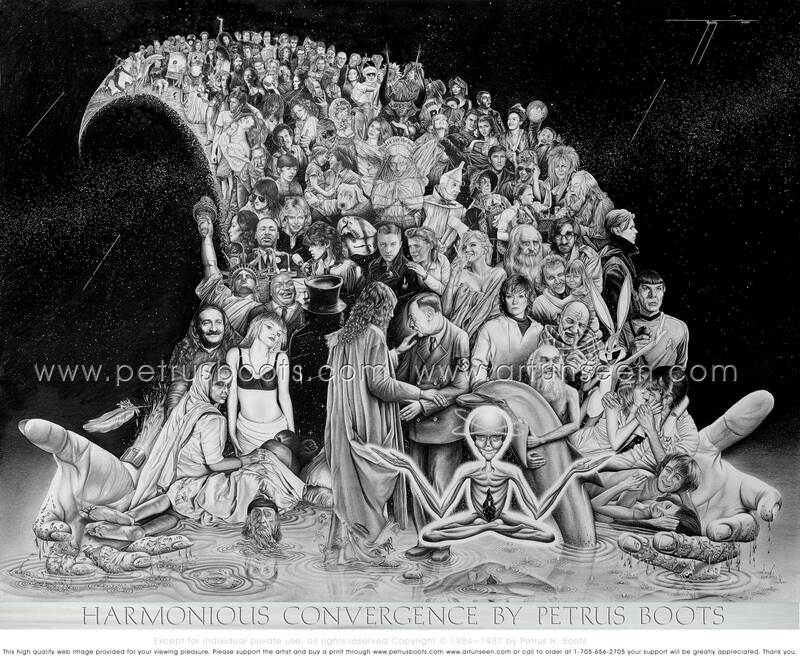 This world event was called the Harmonic Convergence and the drawing, like a gift, had it's title... "Harmonious Convergence"." Harmonious Convergence ~ Limited Edition † is the duo-toned lithograph of the original pencil drawing Harmonious Convergence. This edition of 500 is resized to 80% of the original keeping it within the standard mat size of 32 x 40, for framing convenience. As with all print editions, limited editions by Art Useen are printed on the highest quality acid free rag stock and individually proofed by the Artist. An outlined numbered image key with corresponding list of all persons represented is included with the print.